Institute of Molecular Biosciences > Research Highlight > What created species? 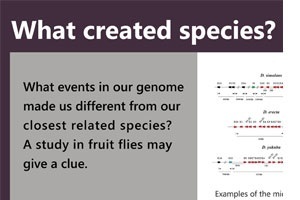 What events in our genome made us different from our closest related species? A study in fruit flies may give a clue. When groups of plants or animals were separated in their habitat, they grew gradually different from one another and after a certain point they became different species. But, at the genomic level, is it only accumulation of mutations? Are there critical changes that cause speciation? A study in fruit fly genomes by Prof. Albert Ketterman suggests that duplication and rearrangement of genes may play an important role in the speciation process. Comparing sequences of a diverse and multi-functional gene family of glutathione transferase among 12 fruit fly species (Drosophila), Prof. Ketterman and Dr. Chonticha Saisawang discovered that the co-linearity, relative positions and orientations of these genes shows that these genomic rearrangements have occurred many times over the course of evolution and divergence of the 12 species. The genome micro-plasticity appears to have contributed substantially to the evolution of a gene family and ultimately to each species. Saisawang C, Ketterman AJ*. Micro-plasticity of genomes as illustrated by the evolution of glutathione transferases in 12 Drosophila species. PLOS ONE. 2014 October;9(10):e109518. Gene rearrangement in speciation of fruit flies.